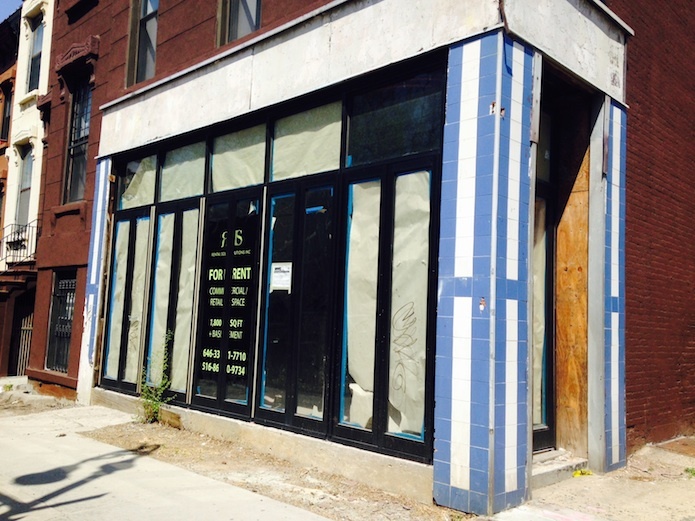 The DOB issued a new building permit for this last month. It will be a five-story building with 118 units, 104,000 square feet, and a garage at the first floor. 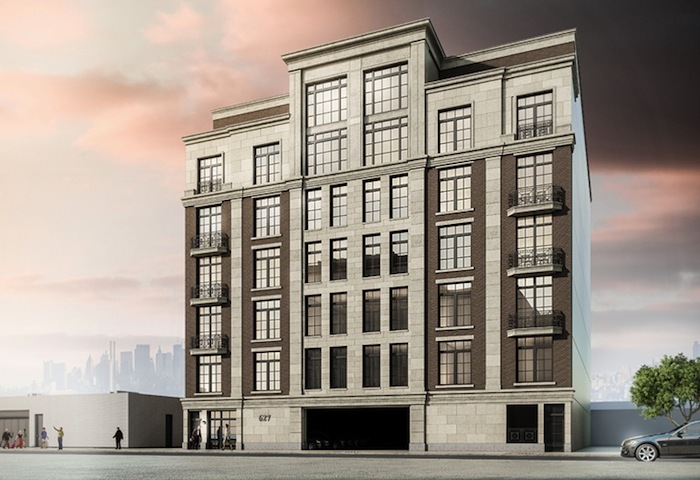 I like this design more than the one proposed for 627 Dekalb Avenue, which is a little more bland. Do you have a preference? 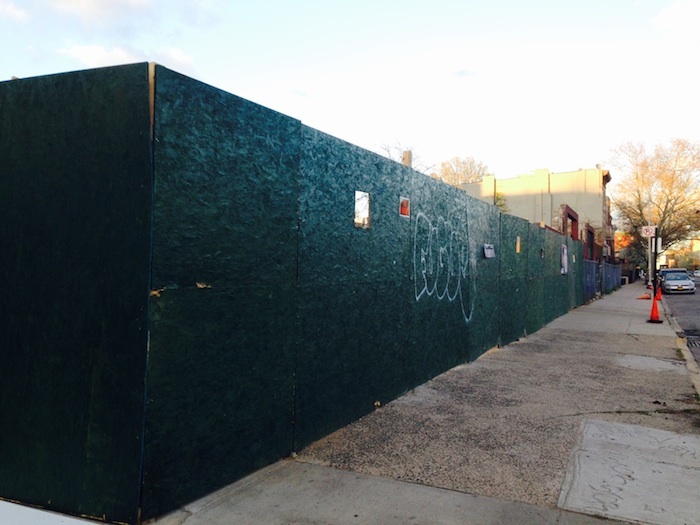 A few years ago I applied for an affordable rental unit at the new Navy Green development, down off Flushing Avenue. I made it past the initial lottery, and basically was required to hand over every piece of my soul (including access to my bank account, statements of all kinds, pay stubs, etc. etc.) to be considered further. I had to trek to an out-of-the-way building way uptown, wait for a long time, provide the info, and then wait months upon months to hear that I had been rejected. In short, I wouldn’t do it again — and I was lucky enough to find a relatively affordable rental in Bed Stuy through some serious Craigslist scrounging. There’s a lot of talk about affordable housing in NYC these days, with Mayor de Blasio promising to build lots of it. Problem is, most of the affordable housing comes as an “extra” in primarily market-rate development. There isn’t enough of it, and it really is like winning the $34 million lottery if you actually nab a unit. That brings me to the announcement above made yesterday by the HPD. 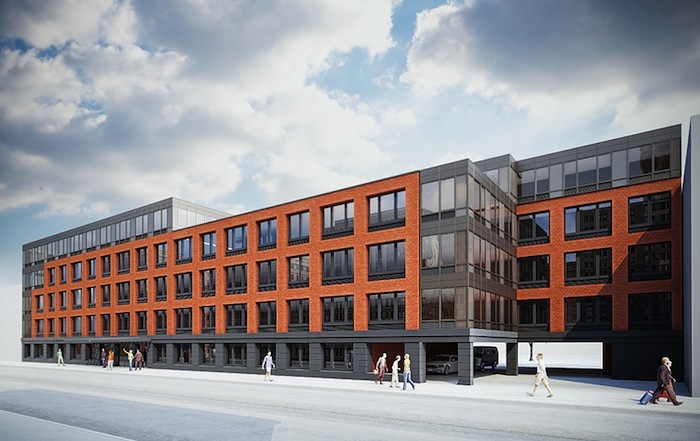 There are two – TWO – affordable rentals available at the new development 296 Throop Avenue. 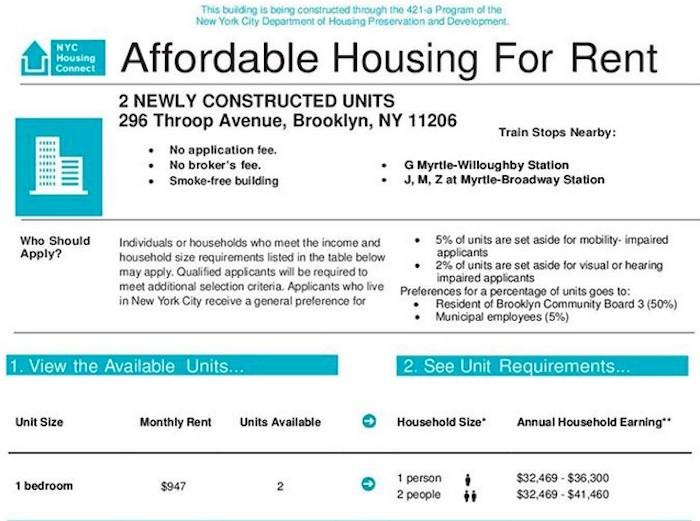 I don’t care if it’s only a six-unit building, it’s just flat-out crazy that in a city of 8 million people, we have its foremost housing agency putting out a notice for two affordable housing units. And I don’t even wanna know how many people are going to apply. If you do want to go for it, there’s a better process set up at NYC Housing Connect since I last tried. (Back then — and it wasn’t that long ago — you just sent in a postcard to be entered into the lottery.) The one-bedroom rentals are priced at $947, and you can only apply if you’re making between $32K and $36K as an individual. Just typing that, my list of complaints about the city’s affordable housing program got longer. I also recommend following the NYC HPD Facebook page, those guys are really great about posting notices when affordable housing throughout New York becomes available.